FITBOMB: Reebok CrossFit Shoes: Game-of-Death Style! 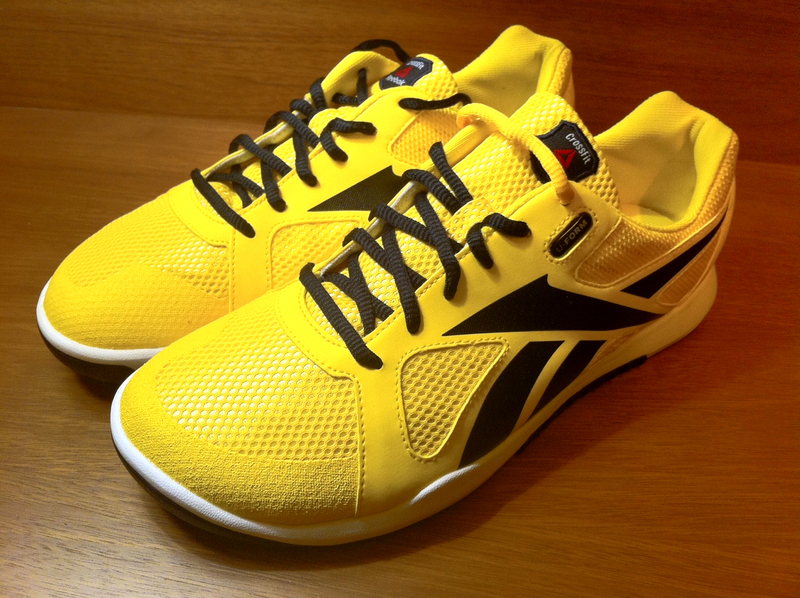 Reebok CrossFit Shoes: Game-of-Death Style! As a: (1) CrossFitter, (2) shoe whore and (3) Bruce Lee fan, there was no way I could pass up these shoes. When I wrote about (and posted photos of) Reebok's new line of CrossFit shoes a while back, I didn't know there were bumblebee-yellow kicks in the pipeline. But today, many of the competitors here at the CrossFit Games sported these kicks as they climbed ropes, clean-and-jerked barbells, and threw softballs (that's right: softballs). The men's shoe resembles the bright yellow Onitsuka Tiger Mexico 66 sneakers worn by Bruce Lee in his final film, "Game of Death" (and by Uma Thurman in "Kill Bill") -- so much so that I half-expect to be able to put on these shoes and defeat Kareem Abdul-Jabbar in hand-to-hand foot-to-foot combat. Sadly, these shoes aren't yet available for sale to the general public. 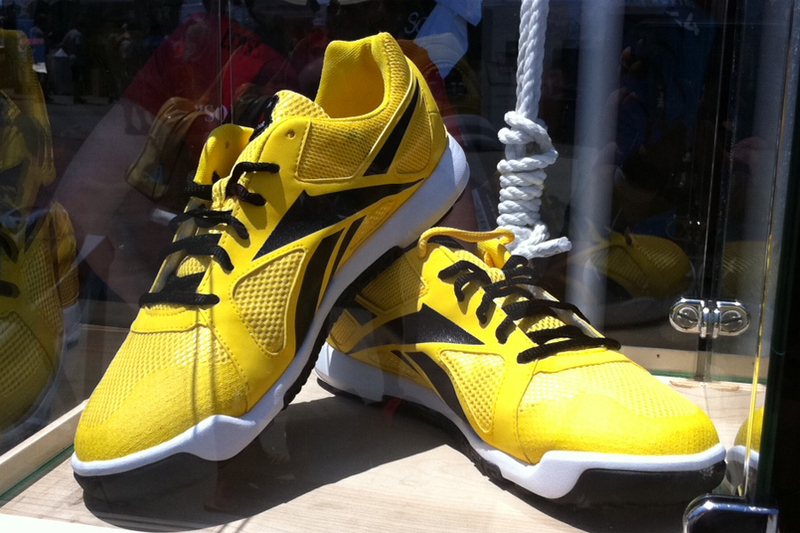 Reebok produced only a limited quantity with which to outfit the individual athletes competing in the Games. The company did, however, bring along some extra pairs in case the competitors' shoes didn't fit -- and the surplus stock was offered for sale today at the Home Depot Center (including the new Reebok CrossFit Oly shoes). They appear to be a big hit; it didn't take long for Reebok to sell out of men's shoes smaller than size 10, and women's shoes smaller than size 8. I was eager to find a pair for myself. I usually wear a 9.5 or 10, but it turns out that these shoes run significantly larger than normal -- so a size 10 in these shoes is more like a size 10.5 or 11. I tried on a pair of 10s in the hopes that they would fit, but my feet were just too damned dainty for 'em. But ever the optimist, I checked the Reebok tent again at 7:30 p.m. tonight -- and managed to score a pair that actually fit my feet. Someone must have returned them, because the sales associate swore up and down that he hadn't seen a pair in my size for hours. I don't care how they got there -- I'm just happy I got a pair. I chatted briefly with Reebok's Chad Wittman today, and he said these shoes won't be on the market until possibly January of next year. Another Reebok employee suggested that they could arrive as early as November 2011, but don't hold your breath. I'll post a review once I log some time in the shoes. But first, I need to get me a yellow tracksuit.